Introduction: After training for SILS cholecystectomy, the technique was introduced in clinical practice to any consenting patients who were candidates for standard four-port laparoscopic cholecystectomy. The feasibility of this technique and frequency of conversions were assessed. Methods and Procedures: Over a one month period, 15 patients underwent laparoscopic cholecystectomy by an academic surgeon. The initial approach was via a single trans-umbilical skin incision using two 5mm ports through different fascial sites. Standard laparoscopic instrumentation was used. Results (mean): BMI: 23-45(34), Age: 30-77(50), Duration: 29-80(51) mins. Diagnoses included symptomatic cholelithiasis, acute and chronic cholecystitis, and biliary dyskinesia. There were two conversions to a four-port cholecystectomy when inflammatory tissue hindered retraction. There was one major complication of post-operative bleeding due to coagulopathy secondary to chronic medical conditions. There was one minor complication of persistent drainage from the umbilical incision. Conclusion: With effective placement of retraction sutures, visualization and retraction are comparable to that of a muti-port approach. 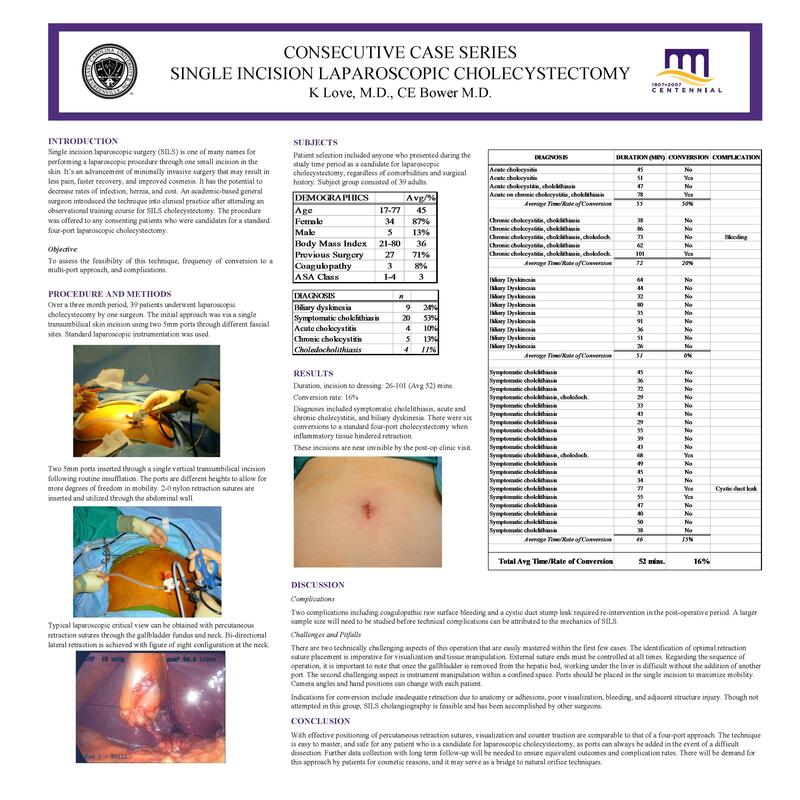 The technique is easy to master, and safe for any patient who is a candidate for laparoscopic cholecystectomy as ports can always be added in the event of a difficult dissection. Further data collection with long term follow-up will be needed to ensure equivalent outcomes. There will be demand for this approach by patients for cosmetic reasons, and it may serve as a bridge to natural orifice techniques.